Note: There are some light spoilers ahead, but it’s nothing that isn’t either revealed or made super obvious in the first third of the movie. I so badly wanted to like Jupiter Ascending. It’s exactly the kind of movie I want to see more of. A big, sweeping space opera based on an original story by two highly talented and inventive filmmakers with a great sense of style and art direction. Unfortunately, none of that can obscure the fact that the movie is just deathly boring. In a lot of ways, the basic plot of Jupiter Ascending is a gender-swapped version of The Matrix. Jupiter Jones is a seemingly ordinary girl, living a mundane life, working a terrible job, and just trying to get by, but all of that changes when she is targeted by some greater power, hidden in plain sight, and rescued by an attractive and highly skilled love interest (Channing Tatum as Caine Wise) who reveals to her that the world she knows is a facade designed to obscure a darker truth about a powerful race that harvests humans to stay alive. Both films even end with the main character flying toward the camera. And you know what, that would be totally fine. The Matrix is a great movie, and there’s nothing wrong with using its bones to make something new. The problem, though, is that in this new version of the story they forgot to give their protagonist any iota of agency. Jupiter Jones is, at best, a chess piece – a living MacGuffin that is pursued and fought over by the film’s various factions to further their own individual agendas, and Jupiter is just swept up in all of this, never taking any action of her own or making any decisions of great consequence. She’s a damsel in distress that has been promoted to the role of protagonist, while the film’s real hero (Caine Wise) is stuck in a supporting role. Now, setting aside for a moment how troubling this is from a feminist perspective (don’t worry, we’ll get to that), it’s absolutely corrosive to building any sort of investment in the film or in its main character. We, as an audience, much like Jupiter, are caught in the crossfire of these larger personalities we have no connection to, and we end up just getting batted back and forth like a ping pong ball from scene to scene without ever feeling like we’re advancing through the story or making any kind of real progress. I tried to be on board at the beginning, I tried to learn who these characters were, and understand their motivations, and their place in the larger world, but the film didn’t seem to pay any mind to whether I understood or even cared what was going on, so I eventually stopped trying. That’s not to say I didn’t get the movie – I did – but I had no connection to it. I wasn’t engaged, I wasn’t invested, I was just being dragged along like a piece of garbage hooked on the fender of a car as it’s speeding down the freeway. What’s especially troubling, and even confusing, is how regressive this film ends up being when it comes to the role of women. On the surface, having a big, expensive, woman-driven film seems like a great thing, but the film never treats Jupiter like she’s the main character. She’s a classic damsel in distress role, with Caine Wise as her knight in shining armor slaying the dragon (even literally, at one point) to save her. Make no mistake, Jupiter may have the title and the point of view, but this is Caine’s story. Jupiter makes exactly one decision in the entire film rather than just acquiescing to the demands of other characters, almost all of which are men. In the end, it feels like the decision to make the film focussed on Jupiter was an arbitrary one that came extremely late in the process, well after the story about Caine Wise and his adventure to save the princess had already been written. We’ve come to expect much more than that from The Wachowskis, and so this whole aspect of the film just baffles me. Yeah, there are some good things about the movie. As visual spectacle, it’s truly a sight to behold, and there are some well directed action scenes (though, without any investment in the characters, they’re not particularly exciting), but the movie is just an unfortunate slog. There must have been something that went wrong here, some conflict between the Wachowskis and Warner that led to the film I saw today, because the alternative – that this is 100% the movie the Wachowskis wanted to make – is just too depressing. 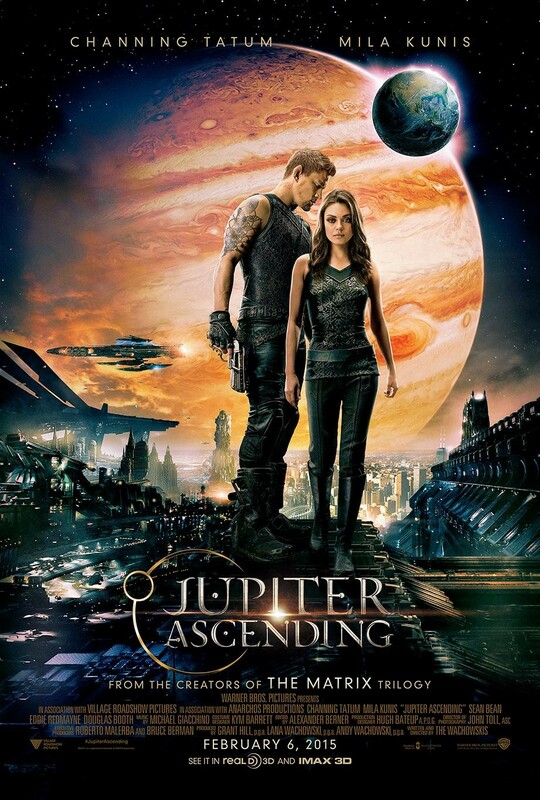 I really wish I had liked Jupiter Ascending, but there’s really not muc to like.